Bobby CAPES [Parents]. Bobby married Linda Carolyn COTTON about 1960. Linda Carolyn COTTON [Parents] was born on 19 Apr 1941 in Greenbrier, Faulkner, Arkansas. She died on 10 Jul 2008 in North Little Rock, Pulaski, Arkansa. She was buried on 14 Jul 2008 in Edgewood Memorial Park, North Little Rock, Pulaski, Arkansas. Linda married Bobby CAPES about 1960. Monroe CAPES. Monroe married Amanda. Amanda. Amanda married Monroe CAPES. George W. RILEY. George married Theda Joyce COTTON about 1956. Theda Joyce COTTON [Parents] was born on 21 Jul 1938 in Greenbrier, Faulkner, Arkansas. She died in 22 Se[ 2001 in Last living in Mulberry, Crawford, Arkansas. Theda married George W. RILEY about 1956. A. B. "Bush" 1863 KIRKPATRICK was born in 1863 in , , Georgia. He died on 5 May 1923. He was buried in Bethlehem Cemetery, Greenbrier, Faulkner, Arkansas. A. B. "Bush" 1863 KIRKPATRICK married Jinks Elizabeth MC CALL. Jinks Elizabeth MC CALL was born in 1869 in , , Tennessee. She died on 26 Feb 1955 in , , Arkansas. She was buried in Bethlehem Cemetery, Greenbrier, Faulkner, Arkansas. Jinks married A. B. "Bush" 1863 KIRKPATRICK. M i Alvin W. KIRKPATRICK was born on 9 Nov 1915. He died on 10 Sep 1996. Grover STALLSWORTH. Grover married Barbara Dale OUTLAW. Barbara Dale OUTLAW [Parents] was born on 25 Nov 1946 in Morrilton, Conway, Arkansas. She died on 1 Apr 2006 in , Pulaski, Arkansas. Barbara married Grover STALLSWORTH. Bernard Ewitt COTTON [Parents] was born on 7 Nov 1924 in Greenbrier, Faulkner, Arkansas. He died on 8 Jul 2007 in , Faulkner, Arkansas. He was buried in Arlington National Cemetery, Arlington, Arlington, Virginia. Bernard married Dorothy Elizabeth BAIN in 1951 in , , North Carolina. Dorothy Elizabeth BAIN was born on 26 Sep 1929 in Dunn, Harnett, North Carolina. She died on 20 Apr 2001 in Little Rock, Pulaski, Arkansas. She was buried in Last living in Greenbrier, Faulkner, Arkansas in Cremated. Dorothy married Bernard Ewitt COTTON in 1951 in , , North Carolina. Edward Clinton BLAIR was born on 18 Feb 1881 in Greenbrier, Faulkner, Arkansas. He died on 15 Jul 1949 in , Faulkner, Arkansas. He was buried in East Shady Grove Cemetery, Greenbrier, Faulkner, Arkansas. Edward married Charlotte Edna "Lottie" TUCKER on 6 May 1906 in , Faulkner, Arkansas. Charlotte Edna "Lottie" TUCKER was born on 26 Apr 1888 in Greenbrier, Faulkner, Arkansas. She died on 7 Oct 1969 in Greenbrier, Faulkner, Arkansas. She was buried in East Shady Grove Cemetery, Greenbrier, Faulkner, Arkansas. Charlotte married Edward Clinton BLAIR on 6 May 1906 in , Faulkner, Arkansas. F i Juanita Adulia BLAIR was born on 17 Dec 1924. She died on 12 Oct 1995. Faber Harold THOMAS [Parents] was born on 12 Aug 1925 in Greenbrier, Faulkner, Arkansas. He died on 10 Nov 2000 in , , Arkansas. He was buried in Pinecrest Memorial Park, North Alexander, Saline, Arkansas. Faber married Floy Dean WOODROME on 2 May 1944 in , Faulkner, Arkansas. Floy Dean WOODROME. Floy married Faber Harold THOMAS on 2 May 1944 in , Faulkner, Arkansas. Jerry Mara WALTER was born in 1842. Jerry married Sarah Ann CARTWRIGHT. Sarah Ann CARTWRIGHT was born on 24 Oct 1856. She died on 10 Dec 1951. Sarah married Jerry Mara WALTER. F i Maggie May WALTER was born on 5 May 1891. She died on 27 Nov 1933. M ii William Joseph WALTER was born on 22 Dec 1893. He died on 7 Jan 1972. 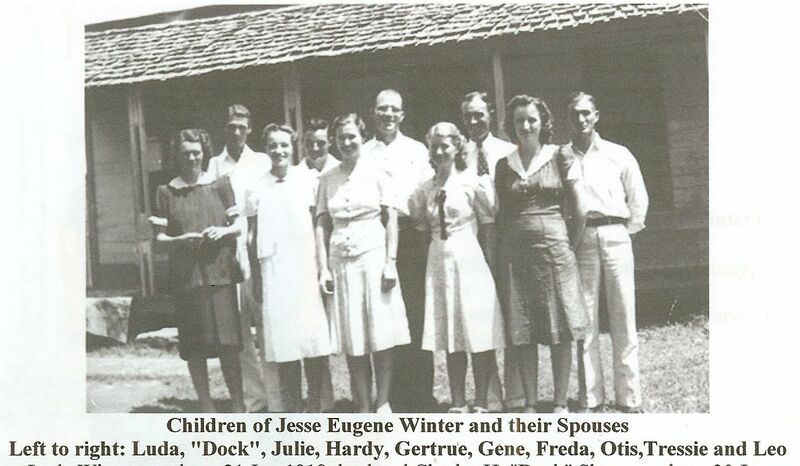 Jesse Eugene WINTER [Parents] was born on 20 Aug 1888. He died on 25 Jun 1959. He was buried in St. Mary's Cemetery, Rosebud, White, Arkansas. Jesse married Maggie May WALTER on 12 Dec 1906. Maggie May WALTER [Parents] was born on 5 May 1891. She died on 27 Nov 1933. She was buried in St. Mary's Cemetery, Rosebud, White, Arkansas. 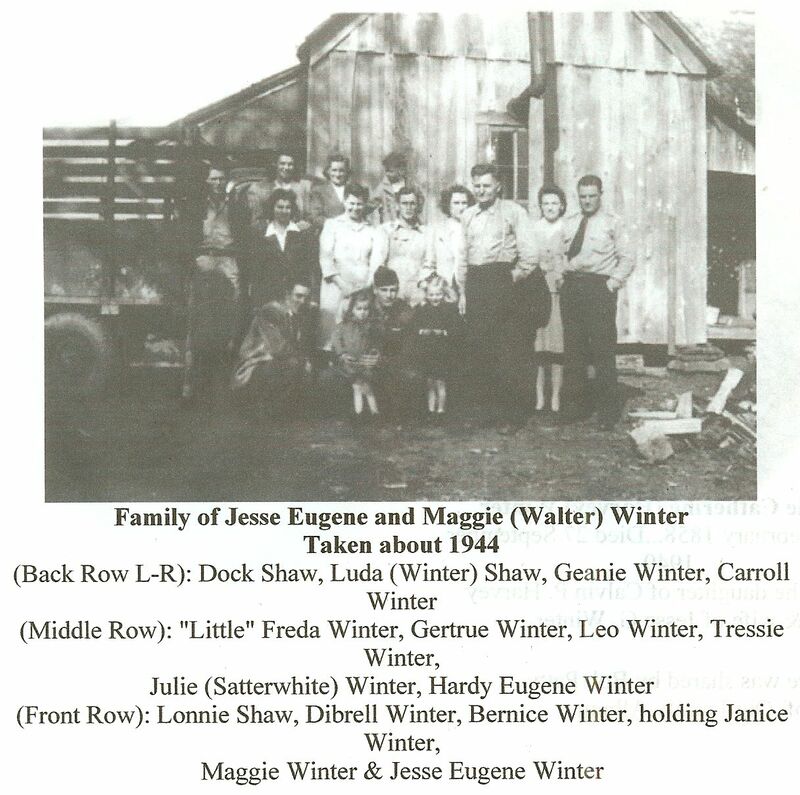 Maggie married Jesse Eugene WINTER on 12 Dec 1906. M i Harley Otis WINTER was born on 16 Nov 1908. He died on 25 Mar 1942. F ii Lily Gertrue WINTER was born on 14 Jul 1911. She died after 2000. M iii Leo WINTER was born on 3 Aug 1913. He died on 23 Nov 2004. M iv Hardy Eugene WINTER was born on 29 Jan 1916. He died on 27 Oct 2005. F v Luda Mae WINTER was born on 21 Jun 1918. She died on 13 Jan 2011. F vi Geanie WINTER was born on 8 Apr 1921. She died after 2000. Allen Bernice WINTER was born on 13 Oct 1923. He died on 7 Jun 1984. Dibrel WINTER was born on 7 Feb 1926. He died on 30 Mar 1973. F ix Freda Genelle WINTER was born on 7 Sep 1928. She died on 18 Sep 1996.